Banks must now account for loan losses on a forward-looking basis, rather than on a historic basis. Boston, December 5, 2018 – International Financial Reporting Standard 9 requires financial institutions to maintain an impairment allowance against the amortized cost of all financial assets held, including loans. Upon the booking of a new loan, and with every publication of the Financial Accounting Standards Board-compliant financial statement, U.S. banks must calculate and disclose an allowance for the total lifetime of expected credit losses for all loans. The shift from an incurred loss model to an expected loss model is a dramatic one that requires banks to make significant changes to related data sets, loss calculation models, their tuning, and their validation. 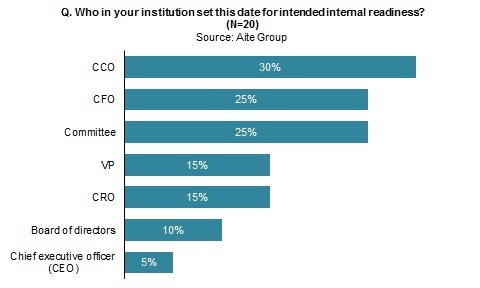 It is in the context of approaching the FASB’s current expected credit loss rule deadlines and their attenuating demands on banks that Aite Group undertook a study of small banks’ preparations for conformance with this new rule. Forming the basis of this report is a July and September 2018 survey, completed on the phone and over the web, of 20 small U.S. banks regarding their preparations for the new CECL rule. This 16-page Impact Note contains 11 figures and one table. Clients of Aite Group's Wholesale Banking & Payments service can download this report, the corresponding charts, and the Executive Impact Deck. This report mentions Finastra, Linedata, MST, Pega, Sageworks, and Wolters Kluwer.